HEAVEN. WE ARE IN HEAVEN. MEGAN: Imagine yourself at the most beautiful barbecue of your entire life, surrounded by all of your friends, a few of your nemeses—to keep things interesting—and the air, a perfect 76 degrees and sunny. The grill in the corner is billowing gentle clouds of smoke; with every lift of the lid, a tantalizing aroma drifts towards you. Mmmm, you think to yourself. I can’t wait to eat two to three hot dogs and call it a day. The hot dog is a perfect food—a fact that I will defend to my grave. As with baloney and Spam, two perfect lunchmeat options that are since fallen out of vogue, it is best not to know or really think about what goes into a hot dog. Nitrates. Other parts. A casing whose provenance is best left unspoken. As discrete units, each ingredient in a hot dog is objectively gross. Combined as a whole, against all odds, they work. What a versatile meat item! A hot dog is sublime on a bun, with ketchup, relish, and those saucy onions, a gustatory vision of what I imagine sleepaway camp to be and also America. Cut up into tiny rounds and sprinkled into a pot of Kraft Mac’n’Cheese, the humble meat stick is transformed into tiny, salty bites. There’s a reason that the corndog is an icon; while a corn-sausage would be delicious in its own way, the complicated flavors of your standard hot link or an Italian sweet would interfere with the hot, sweet crust. A hot dog is the fried corn batter’s perfect foil because a hot dog is a perfect food. What a good dinner! A fine lunch! With an egg (if you’re feeling creative), you have brunch. 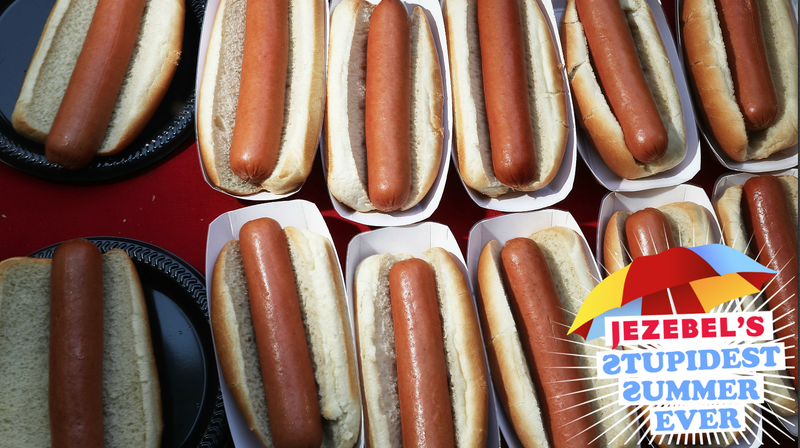 Everyone feels bad about bringing the hot dogs to the barbecue, but no one is ever unhappy to see them. KATIE: Megan, that was all so beautiful. I don’t think I have much to add because you have so perfectly articulated my exact thoughts on this meat, but I will add the story of one of my warmest and earliest memories: I am at my Aunt Judy’s wedding, wearing a long pink dress, a weird flower crown thing, and waiting to perform my duties as flower girl. I am grieving because my aunt, truly my favorite aunt, is getting married, which my young mind has processed as a kind of abandonment. The waiting is difficult and I am resentful of what I am waiting for; I am a bored and restless 5-year-old, inconsolable at the thought of losing my aunt to another person. I am on the verge of a bursting into tears when a kindly waiter at the Queens catering hall spots me, face full of emotion, and puts a plate of miniature hotdogs in front of me. I eat them, a moment of melancholy having turned into something closer to joy.